Exploring haunted remains on a beach in Brooklyn. I’d heard of Dead Horse Bay as a very shanky, unfinished glass East Coast version of California’s “Glass Beach” years ago, and became especially curious about it after watching the ABC documentary Dead Horse Bay: New York’s Hidden Treasure Trove last year (opening quote: “The truth of our lives is not always in the stories we tell, but in the stories we leave behind with our stuff.”). After it was used for processing dead horses, the site was a poorly-constructed landfill for many years and eventually capped, but the cap burst and the trash spewed out onto the beach beginning almost immediately after it began in 1953. Sadly, the landfill was created from the homes of Brooklyn residents who lost them due to eviction when their houses were razed for new construction. Truckloads of debris were brought to the site, dumped on the beach, and covered with sand, and each day new layers of trash erode out. The water is full of hundreds of bottles, pottery shards and other debris. The documentary tells the story of the modern beach: the site is now owned by the federal government and is a national park. According to a ranger in the video, taking anything from the beach is forbidden by law, though he seems nonchalant, doesn’t mention enforcement, and beachcombers come regularly. One artist creates art from found objects there while a schoolteacher and his students are the only ones who have obtained permission from the government to collect at the site, and have created a school exhibit of life in 1953 based on the beach finds. I visited Dead Horse Bay last week for the first time. Clearly, since the documentary, it has been visited more often and doesn’t have anywhere near the amount of material on it that appears on the film. Apparently people weren’t discouraged by the information that it’s a federal offense to remove items (some would say litter) from the beach. 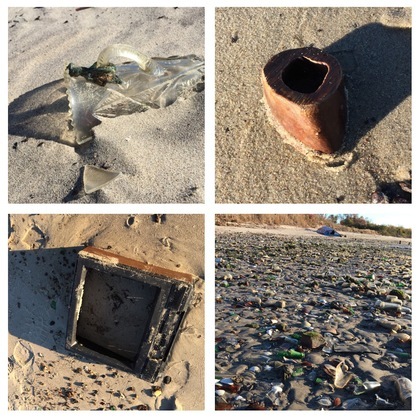 From a beachcombing perspective, the same controversy that rages currently at Fort Bragg (Glass Beach) in California exists here, though the beach glass is in a far different condition. Here, the glass is freshly eroding out daily from a landfill, so it’s not wave-worn and “frosted” like California glass. However, here, you can find whole, mint-condition bottles, marbles, decanter stoppers, plastic toys and so many more remnants of daily life from the time capsule that is Dead Horse Bay. I took a sampling of bottles, glass and pottery, enough for a small display to remember my trip there. If the Federal Government wants to hunt me down for it, that would be fine, though I can say there isn’t a single sign on the site forbidding taking glass from the place. It’s a haunted and haunting place. You get the sense of connection between people’s things and the people who owned them. It’s impossible not to pick up a whole coffee cup and think about the person who drank from it, to hold a toy and think about the child who played with it. The mass hordes of entangled pantyhose are creepy, as are the dozens of floating soles of shoes in the water, and most especially the three horses’ hooves I found (and did not take). My response to the teacher in the video who makes an appeal to take nothing: when there’s a Dead Horse Bay museum, and it’s open to the public, I believe significant items should be donated there (he’d be the perfect curator) so that everyone could be educated on the site and its history. Shame on the Feds for not opening a museum on the grounds of the national park there (there are plenty of vacant buildings). Somebody should get funding and make it happen; what a fascinating place it would be. Then, perhaps some “crowdsourced beachcombing finds” could come together and be enjoyed by all.